From left to right, Sylvain Grenier, John Morra, Francis Crevier. Photo courtesy of PoolStream.Tv. Tapis Vert Pool Hall in St-Foy Quebec just outside of the provinces beautiful capital of Québec City, was the scene of this weekends Pro Tournament. This was a 32 player max event with $2700 added. 10 Ball call shot and safeties was the game with races to 10 on the B-Side and 8 on the losers side. The small max field with the added money attracted players like John & Mario Morra, Alain Martel, Martin Daigle,Francis Crevier and Danny Hewitt. The story of course was that number 1# ranked Canadian player John "Mr. Smooth" Morra was driving down all the way from Toronto to take part. Morra fresh off his second place last week at the Chinook Winds 8 Ball was looking to keep the ball rolling this weekend. The Québécois were excited for the opportunity for their best to go up against another world class player just weeks apart from Johnny Archers visit to Valleyfield . Just like for Archer a few weeks ago, a win for Morra was far from automatic. In fact this field had all the top players from the province in it. While due to protest in Valleyfield, that tournament only had a sprinkle of the top ranked players around. Even with this reduced level of talent in the field Archer had to settle for second place as Francis Crevier beat the Scorpion in a double hill match to take the title, a testament to the level of play in Québec. "Mr. Smooth" cruised through the beginning part of this field before he ran into Crevier in the winners side final. This was a close affair the entire way as each player traded racks, in the end Morra edged out the local favourite in a thrilling double hill match 10-9. Crevier than waited for the winner of Alain Martel vs Sylvain Grenier to see who he would have to beat to set up a rematch with Morra in the final. Grenier got by Martel 8-6 and Crevier got by Grenier with the same scoreline to set up the highly anticipated rematch. In the final it looked as if fans were going to be treated to another hill match. However at 7-6 ahead Morra found another gear and pulled away and went on to win 13-7. The guys at www.poolstream.tv offered a great stream all weekend for the bargain price of 5$. Unfortunately there was a connection problem which was out of their control as even the pool hall could not except interact or credit card charges at the time. To those who missed the final you can see it by clicking here. Also if you send them a message they will give you a free pass to their next stream as a make up for what happened yesterday. 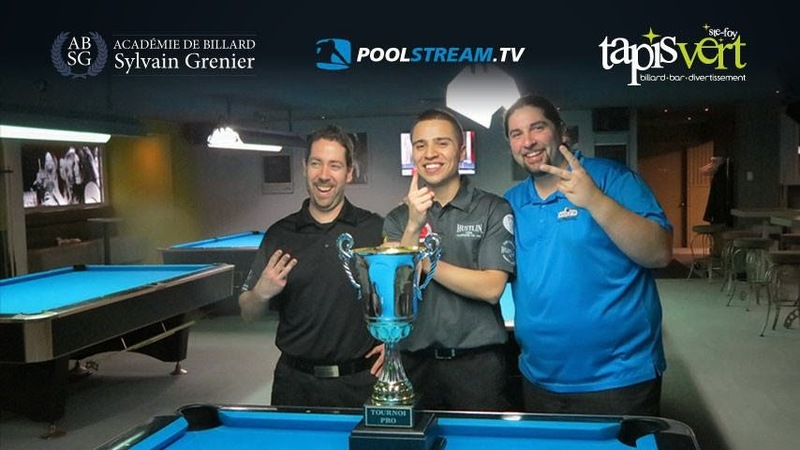 The other story line in this tournament was the impressive wins over Martin Daigle and Danny Hewitt by Daniel "Cold Blood" Gagné. This is a well known player in Québec but it would be fair to say not a favourite in either of those matches. With names like Salvas, Hewitt and Martel dominating Québec pool for the last two decades, performances by Gagné and Crevier could be signalling a changing of the guard of sorts. In conclusion I think it is safe to say that Crevier after this month will not be sneaking up on anyone anymore. For those doubters I believe he has solidified himself as another world class player from Québec.